Anniston is an unremarkable town now known for the Anniston Army Depot and the Talladega Superspeedway, both nearby. The army depot is the mainstay of the economy and nearby Talladega Mountain provides recreation opportunities. At one time, the area was a planned company town, and later a health resort, and there is still some historic interest in town. Oxford is a smaller tow n south of Anniston located on the east-west I-20, and its location on the freeway has brought some new development and commercial growth. Cost of living profile is attractive, but is overshadowed in overall ranking and scoring by the relative lack of other features and amenities. Anniston is located in a wooded valley of the Appalachian Foothills just to the west of Talladega Mountain (actually a 60-mile long ridge, not a single mountain). Cheaha Mountain, about 15 miles south, is the highest point in the state at 2,400 feet. The climate is humid subtropical with an occasional continental influence. Four distinct seasons include long, warm, humid summers and mild winters with occasional cold snaps, ice storms, and snow. First freeze is mid-November, last is mid-March. The median home price in Choccolocco is $187,600. Browse Homes in this Range. 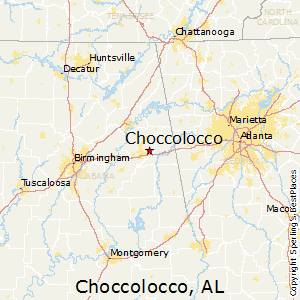 Compare Choccolocco, Alabama to any other place in the USA.